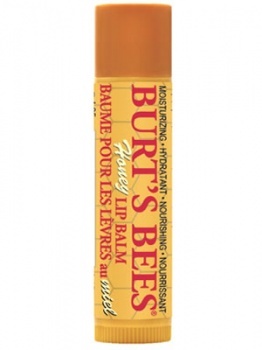 Burt's Bees Honey Lip Balm is a new lip balm by Burt's Bees to add a little difference to your lip balm routine!! Burt's Bees Honey Lip Balm is 99.82% natural, for a lip balm that won't create a chemical crave!!! Burt's Bees Honey Lip Balm is made with sweet, soothing honey to help moisturize and protect lips in the gentlest way. Plus, it's packed with beeswax, shea butter, almond oil, and cocoa butter and ultra emollient lanolin to keep your lips soft and healthy. Made with sweet, soothing honey, this natural lip balm moisturizes and nourishes lips in the gentlest way. Plus, itÕs packed with beeswax, shea butter, almond oil, cocoa butter and lanolin to keep your lips soft and healthy. Apply balm to your lips as often as needed, particularly in dry, cold or windy conditions. This sweet, fragrant, syrupy substance produced by bees soothes and adds softness to the skin, and is an excellent natural moisturizer.